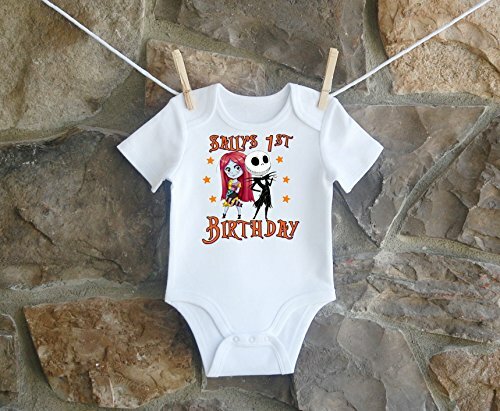 Personalized Nightmare Before Christmas Jack Skellington Group Shirt For Girls ***Personalized Girls Birthday Shirt*** This is an heat pressed transfer design...Not embroidery I use a commercial heat press as well as a fine commercial grade paper. All images you see are in digital format so may appear slightly brighter in the sample picture. You will receive an iron on heat pressed design. Colors can vary slightly during the heat press processing. **PLEASE MAKE SURE YOU CHECK OUT WITH CORRECT INFORMATION IN THE CUSTOMIZATION BOXES PROVIDED** EXAMPLE: PLEASE SPELL CHILDS NAME CORRECTLY. Please note: if you choose to provide two names or name is long the font the will be smaller than what you see in design sample. Bodysuit Sizes: 6-12 Month Bodysuit 12 Month Bodysuit 18 Month Bodysuit 24 Month Bodysuit I use Carter and Creations of Grace brand bodysuits. PLEASE LOOK IN PHOTOS ABOVE FOR BODYSUIT/ RABBIT SKIN FITTED SHIRTS SIZE CHART Complete care instructions for shirt will be mailed with all orders. Due to the customization of this product I can not accept returns. Custom orders welcome, please contact me for details.